Stonehenge is, without a doubt, the most famous set of rocks in England. However, there are many other henges and rock circles scattered around the landscape, mainly in the Wiltshire District of Southwest England. 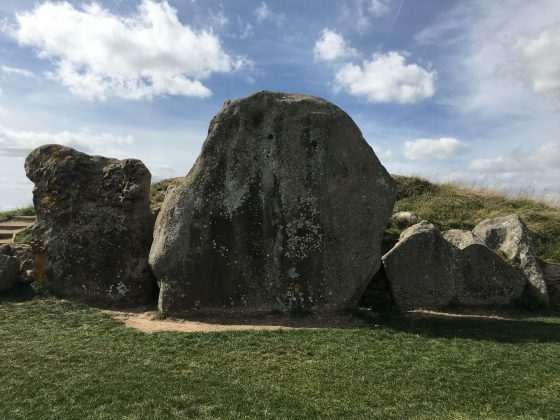 We hired Anne Martis of ToursByLocals to take us to Wiltshire and show us several significant henges. Anne, who lives in the Cotswolds, is highly knowledgeable about this part of the country. 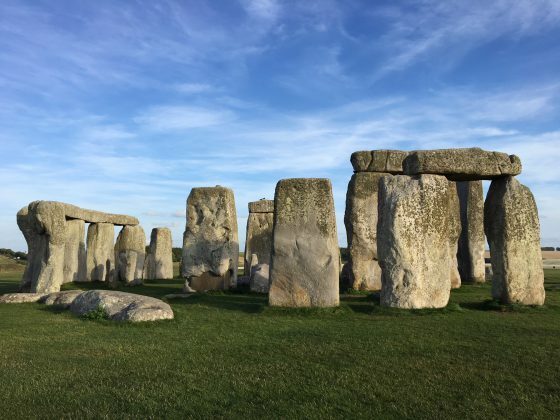 She planned our day perfectly, so that we would catch the last shuttle from the museum to Stonehenge and have this incredible place almost to ourselves at sunset. 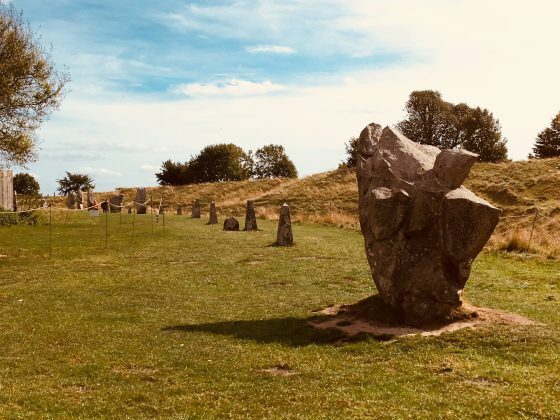 We visited Avebury first. 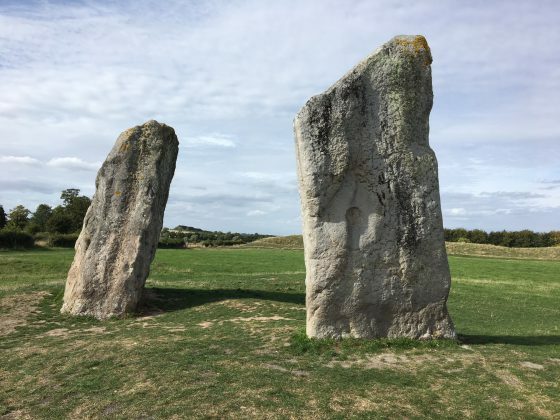 This is a Neolithic henge monument containing three stone circles, including the largest megalithic stone circle in the world. It was constructed over several hundred years, from 3700 – 3500 BC. It is a place of religious importance to contemporary pagans, and we saw a small group sitting in a circle near the male and female rocks, clearly absorbed in their thoughts. These rocks at Avebury are called the male and female rocks. 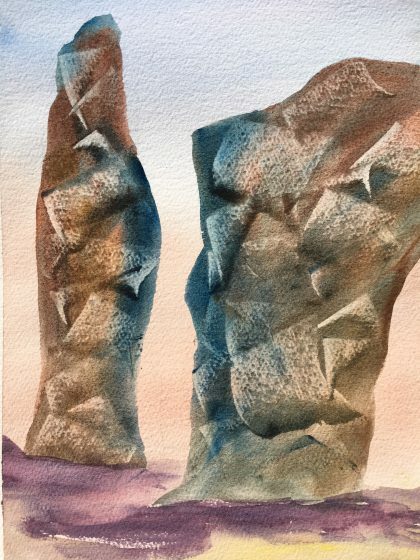 My watercolor interpretation of the Male and Female Avebury rocks leaning in toward one another. We then walked up Silbury Hill to the West Kennet Long Barrow, a Neolithic chambered tomb (also called a barrow). 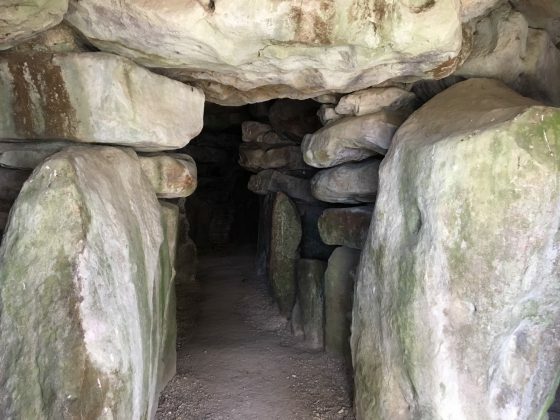 You can walk right inside the passage to experience the atmospheric internal burial chambers, where some 50 skeletons were discovered. It is estimated that 15,700 man hours were spent in its construction. 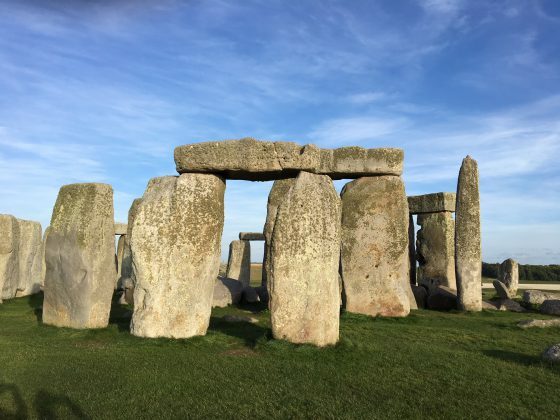 Archaeologists date the construction to around 3600 BC, around 400 years before the first stage of Stonehenge, and it was used until around 2500 BC. It was such a moving experience to walk through that sacred burial place! 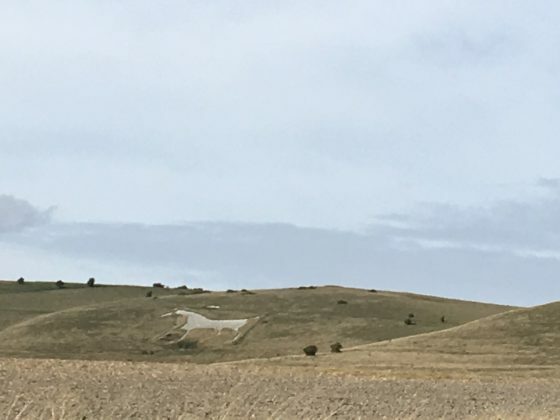 Only about a mile away is one of seven white chalk horse figures carved into the English landscape around 3,000 years ago. When I lived in London in 1967-68, my roommate was sort of Twiggy-looking model named Caroline. She was a bit of a wild child, and on New Year’s Eve she and some of her friends piled into her tiny red Triumph and drove from our flat in Earl’s Court to Stonehenge. I heard tales of their dancing and drinking among the rocks until sunrise. I suspect it was orgies such as this one that now prevent the rest of us from getting close to the rocks. There are ropes that prevent visitors from getting closer than about ten feet away. It’s okay, though! This place, sacred to so many, still holds a spell, especially as the sun starts to sink in the sky. 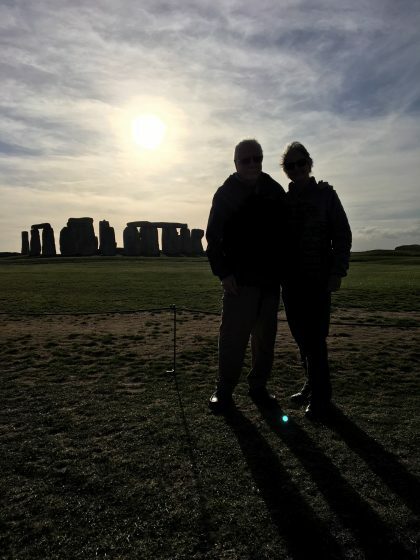 Mahalo to Anne Martis for insisting we have a photo taken at Stonehenge. Stonehenge is Britain’s most celebrated prehistoric monument, thought to be between 4,000 and 5,000 years old. No one knows why it was built, but some believe it was constructed as an astronomical observatory or a sanctuary for a sun worshiping cult, or perhaps a combination of the two. 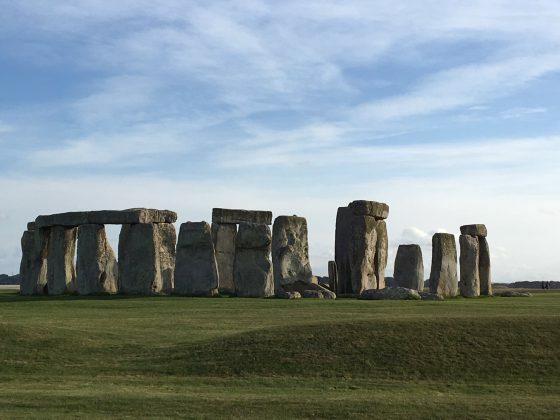 Regardless of its original purpose, Stonehenge holds tremendous power over anyone who stops to appreciate its awe-inspiring beauty. 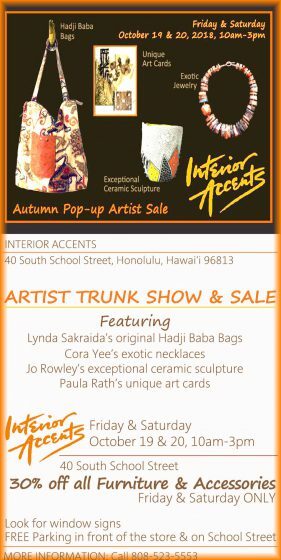 Please come to our Autumn Pop-Up Artist Sale next weekend! We have all been creating like mad so you can expect lots of fresh new art and craft. I recently visited Lynda Sakraida‘s studio and she has been creating some of her most beautiful bags EVER. 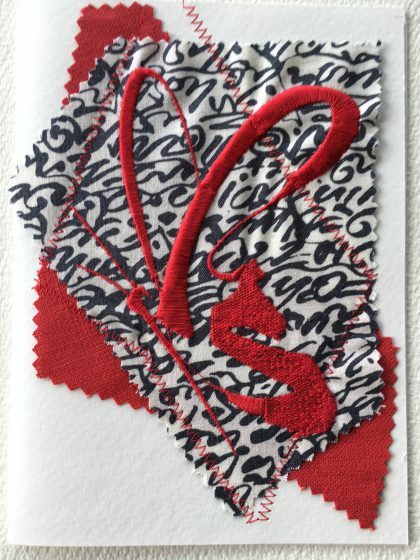 Here are images of just a few of the cards I have been making for the sale. 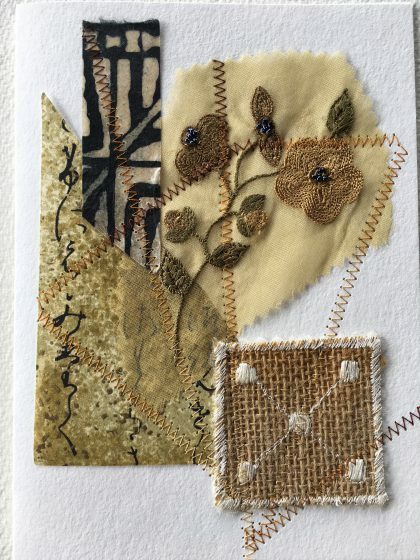 They are all mixed media fiber art, sewn onto watercolor cards. 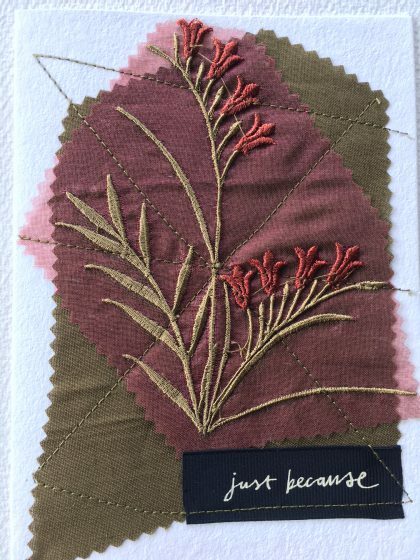 Every card is unique and one-of-a-kind, which is also true of Lynda’s bags, Jo’s ceramics and Cora’s jewelry. So be sure to come early for best selection. And, as an added bonus, Interior Accents is offering 30% off on all furnishings and accessories. 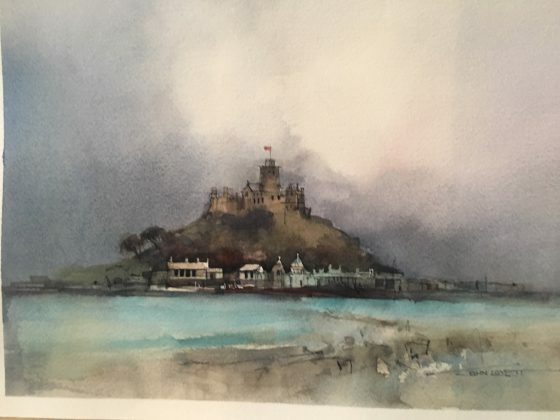 I love John Lovett’s painting of St. Michaels Mount! Who knew there is a place in Cornwall that looks much like Mont St. Michel in France? Yep, it’s called St. Michael’s Mount. It’s an island just offshore from the town of Marazion. It’s surmounted by a castle and fortress and contains a chapel where some religious rites of the local people were conducted. At the base of the Mount was the small community where the majority of the Mount’s inhabitants, the families of fishermen, resided. Now the island is under the control of the National Trust. At certain times of day, people can walk out to the island. However, we got there just as the tides were coming in and it was impossible. 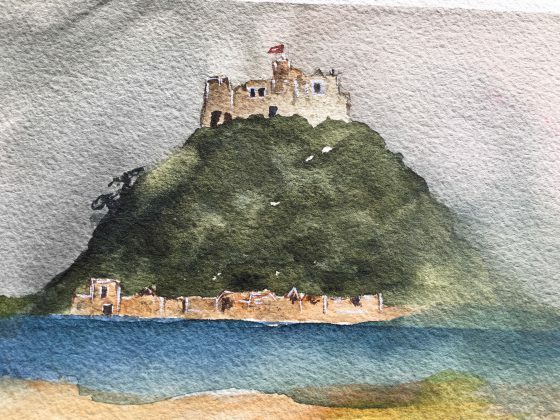 My painting of St. Michael’s Mount. I used really rough paper! Instead, we clambered over big rocks on the beach, chose a rock to sit on and another rock on which to place our palettes, paints and paper and merrily painted among the stinky seaweed. Dartmouth, often referred to as the Jewel of the South Hams, was busy with tourists the day we painted there. It was a bank holiday and lots of Brits like to travel to this port side town for a breath of sea air and some shopping. Dartmouth features a cobbled marketplace and ancient narrow streets with lots of art galleries and specialty shops. Ice cream seems to be quite a thing here too. And boats. Lots and lots of boats, John’s favorite subject. Nearby is England’s version of Annapolis, the Royal Naval Academy, where their naval officers are trained. 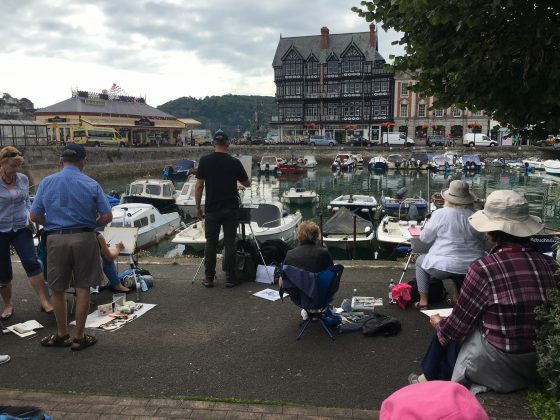 The group gathers to study and paint boats on the water at Dartmouth. 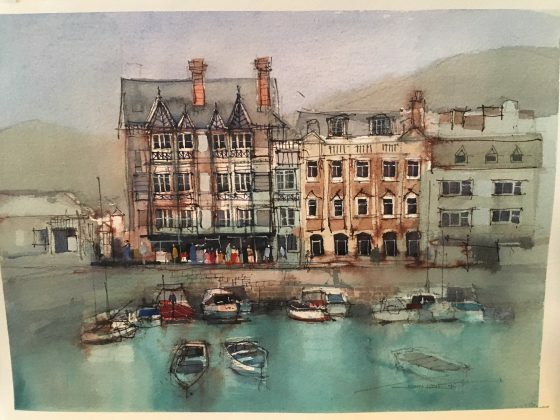 John Lovett’s painting of Dartmouth port. 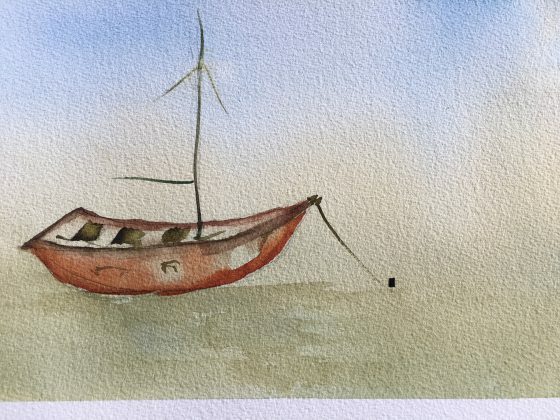 I finally succumbed to John’s passion for boats and tried to paint one of my own. 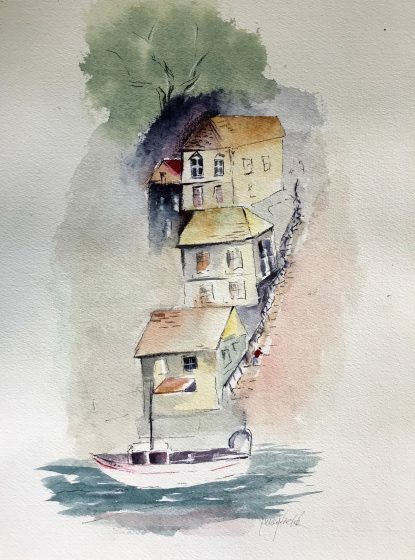 Paula’s painting of, you guessed it, a boat. I found this lovely plaque in Dartmouth. 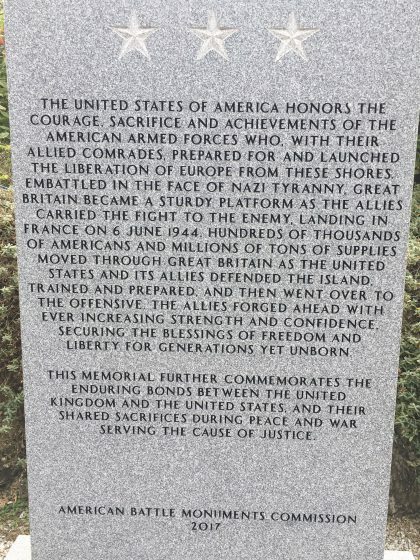 This plaque sits in the main town square in Dartmouth. It’s interesting that World War II is still a clear memory in England. They never want to forget what a nightmare it was for them. And we were, during those terrible times, viewed as their rescuers. 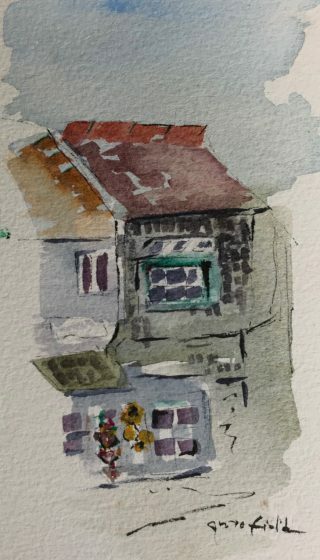 After leaving the Cotswolds, our painting group packed up our palettes and took a bus ride to Plymouth, in the heart of Cornwall. OK. I must confess I was a little disappointed in what we saw of Cornwall. I am a passionate lover of Masterpiece Theatre’s “Poldark” on PBS and I expected to see those rugged, moody cliffs and moors. Those were about ten miles away from where we stayed. 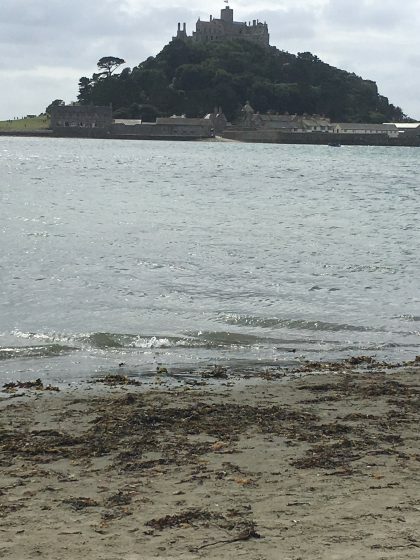 But what we did see was several lovely little seaside fishing villages and a surprising island called St. Michael’s Mount that looks a lot like its namesake, Mont St. Michel in France. 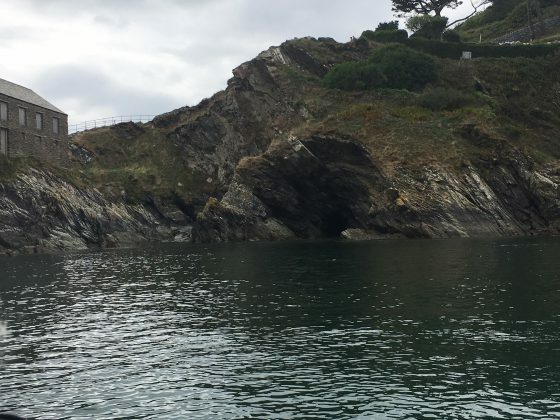 One of the fishing villages where we painted was Polperro, also known as “Smugglers Village.” Located on the southeast coast of Cornwall, its landscape is marked by a myriad of caves, ideal for smugglers’ hiding places. I played hooky from painting class and went on a boat ride up the coast to see the smugglers’ caves. It’s a beautiful coast and there are countless caves, ideal for hiding. These Cornwall fishing villages are so scenic! The colorful little cottages tumble down to the sea and there are all sorts of boats, from fishing and crabbing boats to tugs and leisure yachts. 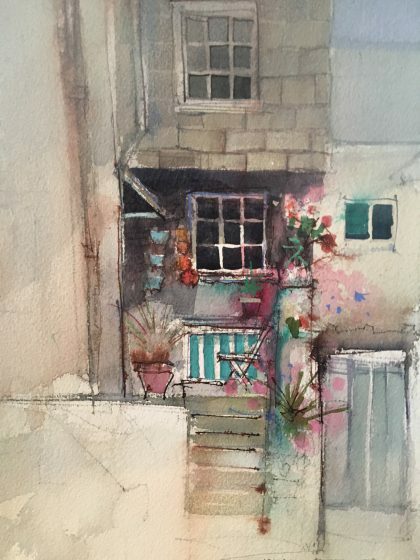 This is one of John’s favorite subjects to paint, so he went to town! Jerry was also inspired by Polperro Village, as you can see in the painting at the top of this story. We visited another fishing port, Mevagissey, where the subject was boats, and there we a lot of boats from which to choose, all shapes and sizes and purposes. I must mention how incredibly lucky we were with the weather throughout the watercolor workshop. Having two weeks of clear weather for plein air painting in England is truly remarkable! Jerry interprets Mevagissey in his inimitable style! Mevagissey is famous for its mussels, scallops and crabs. You could see men shucking them (is that the correct verb?) in little seaside warehouses. We loved this village. It has little narrow, winding streets and some lovely shops. Lots of Poldark-related merchandise, such as Poldark Rum, Poldark chocolates and Poldark biscuits. We ate fish and chips in a fun pub filled with locals, including the “local dog,” a golden retriever name Leopold. Dogs are welcomed everywhere in England, and we often saw water bowls in front of places of businesses for the neighborhood – and visiting – dogs. We also visited Dartmouth, home of the British naval officer training college, and St. Michael’s Mount. Those are up in the next blog. 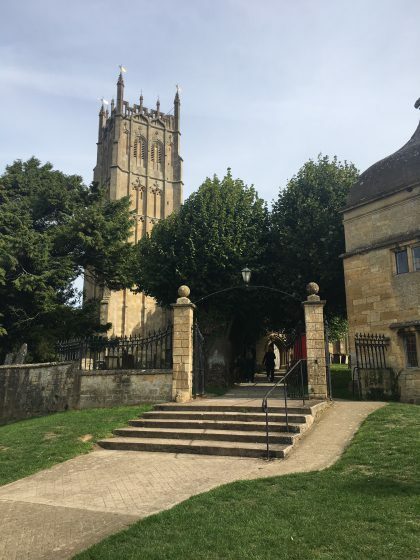 We spent one day with a private guide who took us through the Cotswolds. We didn’t go to the villages we had already visited when painting (Stow-on-the-Wold, Bourton-on-the-Water and so on), but rather visited villages that were new to us. We found our guide, Anne Martis, through a company called ToursByLocals, and she was exemplary. And she lives in the Cotswolds and knows every inch of this region. 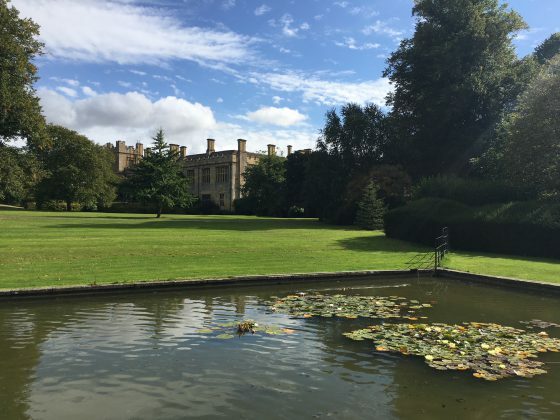 As you enter the Sudeley Castle grounds, you see this lovely pond. 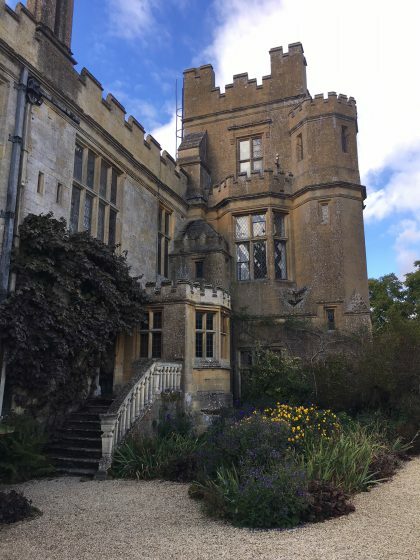 Although castles are not one of Jerry’s favorite things, I really wanted to visit Sudeley Castle, near Winchcombe. It was built in the 15th century and was home to Catherine Parr, the sixth (and final) wife of Henry VIII. It’s still a residence of the Dent-Brockley family. And, hey, there’s a Hawaii connection! Henry Dent-Brockley married a Maui girl and they both live on Maui. They own a company called Island Essences. Their lavender fragrance products are sold in the castle’s gift shop. One of the traditional English gardens at the castle. The gardens of this castle were a highlight for me. 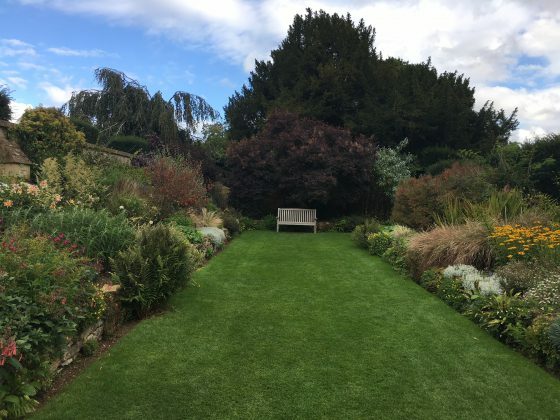 They are luscious and gorgeous and there is a lot of variety, from a water lily pond to formal English gardens. 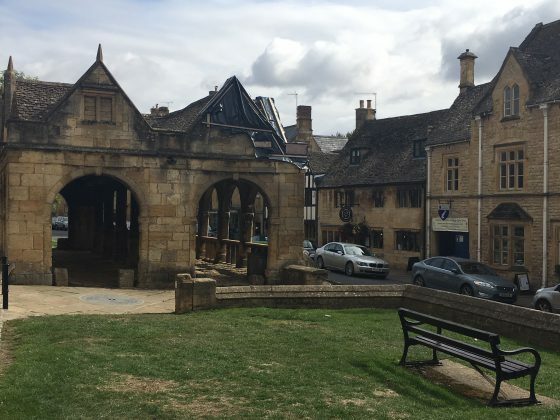 Chipping Campden’s Market, located on the High Street. If I were to live in a Cotswold village, it would have to be Chipping Campden. The High Street here is considered the finest Medieval street in England. 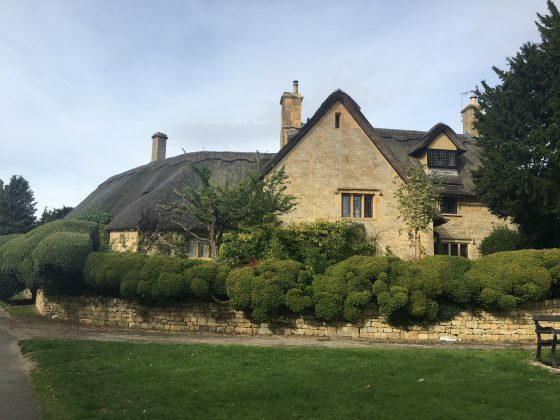 Just another beautiful thatched roof in the Cotswolds! There is an impressive amount of art and craft in Chipping Campden. We visited the Court Barn Museum, which features fascinating exhibits on the history of the Arts and Crafts Movement in the Cotswolds. Pottery, quilting, weaving, glass, silver smith work, book binding – and more – were done here throughout the centuries. 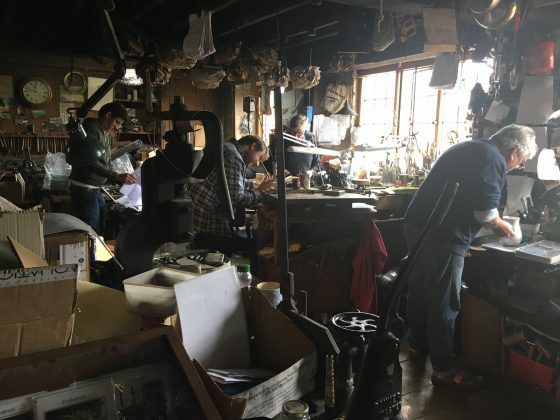 We also visited the workroom of Hart Gold and Silversmiths, renowned for their design and workmanship. There were three workmen there, creating a chalice. This attic workroom is so atmospheric. Check out the baskets hanging from the ceiling. That’s where they kept the receipts! An interesting bookkeeping system! Just off the High Street, this beautiful church. 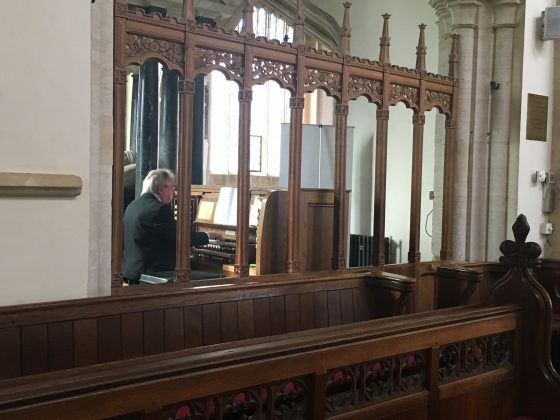 We really lucked out when visiting a church in Chipping Campden. They were preparing for a wedding and the organist was playing music. 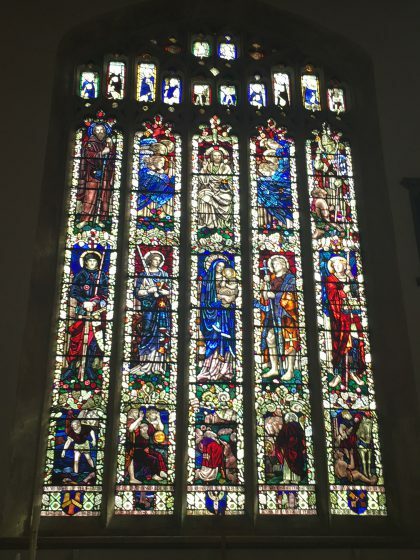 It was a divine way to experience the glorious windows and the historical and interesting church. The organist told me he was playing this piece for the first time. He was given the music this morning and the wedding was in the afternoon! Not easy to see here, but the windows at the top are contemporary in style. I ran into fellow traveler Nancy Pace last night at “Hello Dolly” at DHT (which was absolutely fabulous in every way – you rock, Loretta Ables Sayre! ), and Nancy stayed in Chipping Camden last year and loved every minute of her time there! She found her B&B through Rick Steves. He is a great source for England. 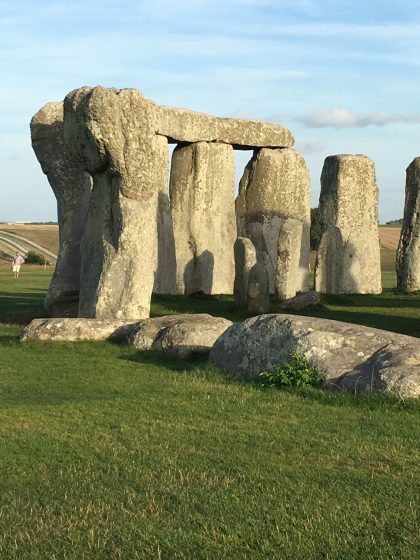 More England blogs coming soon: Cornwall, Lower Heyford, London, Stonehenge…and more!